Don't damage your plastic sheet by using a standard drill bit! 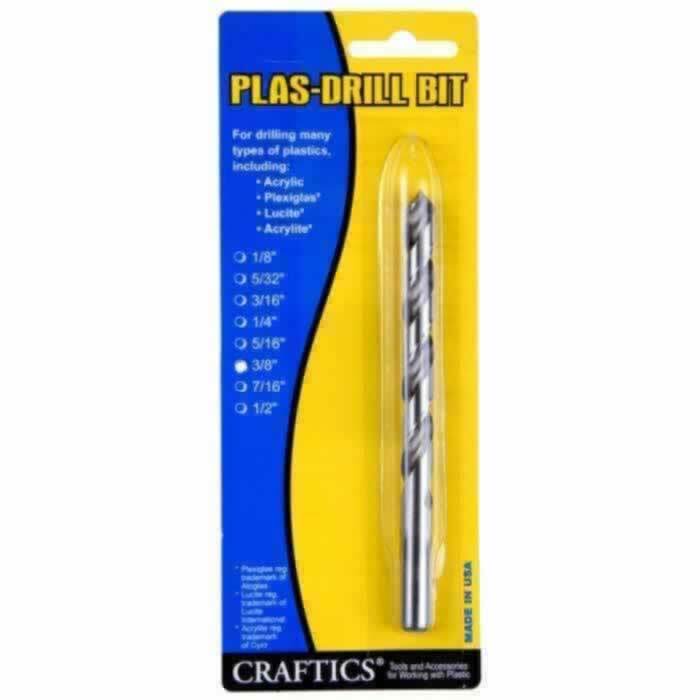 These specially designed drill bits are safe for use on KSC polycarbonate and plexiglass acrylic sheets. Ideal for use with Plexiglas, Lucite, Acrylite, or Perspex acrylic sheets. Also ideal for Lexan, Tuffak or Makrolon polycarbonate sheets. These are specially ground flukes with a 90° point for drilling holes and special 60 degree angle. Size available: 1/8", 5/32", 3/16", 1/4", 5/16", 3/8", 7/16", 1/2"
When drilling holes for screws be sure to make the hole larger than the screw to allow for expansion and contraction of the material. If you do not drill the hole large enough it will cause stress cracks at the hole that will spread. Always have a backer board behind the plastic sheet when drilling - most problems happen when you punch through the back side. Don't damage your plastic sheet by using a standard drill bit! These specially designed drill bits are safe for use on KSC polycarbonate and plexiglass acrylic sheets. Ideal for use with Plexigla, Lucite, Acrylite, or Perspex acrylic sheets. Super-high impact strength, clear plastic sheets that are virtually unbreakable. Available in 5 thicknesses & 33 standard sizes.